New theories come and go about methods of evangelism involving psychological concepts, social theory, marketing models, church growth strategy and obscure texts applied more widely than intended. The irony is that we have a model for evangelism staring us in the face in the story of the early church told by Like through the book of Acts. So, it's time to realign your thoughts on evangelism in tune to what God has to say. It's time for ACTive Evangelism. Derek Prime (Bible Answers: To Questions About the Christian Faith & Life) guides us through the book of Acts giving very practical examples of how to do evangelism in the workplace, with our neighbors, to our families, as a church and individually. In each chapter Prime looks at the context the disciples were ministering in, the challenges they would have faced, the methods they used, and then applies it to our situation today. New theories come and go about methods of evangelism involving psychological concepts, social theory, marketing models, church growth strategy and obscure texts applied more widely than intended. The irony is that we have a model for evangelism staring us in the face in the story of the early church told by Luke through the book of Acts. So, it's time to realign your thoughts on evangelism in tune to what God has to say. It's time for ACTive Evangelism. Derek Prime guides us through the book of Acts giving very practical examples of how to do evangelism in the workplace, with our neighbours, to our families, as a church and individually. In each chapter Prime looks at the context the disciples were ministering in, the challenges they would have faced, the methods they used, and then applies it to our situation today. Derek Prime has devoted himself to an itinerant ministry and to writing since 1987 after 30 years of pastoral service to churches in the UK. New theories of evangelism come and go. 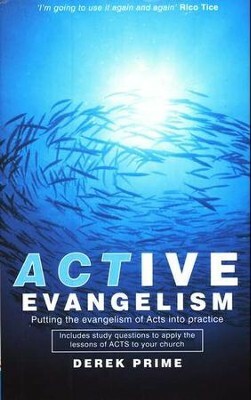 Derek Prime shows that we need look no further than the Book of Acts for our model of evangelism. Each chapter focuses on a passage in Acts, identifies the evangelistic principles and methods, and concludes with a relevant and practical application to our 21st century context. Study questions help the reader to apply the lessons to their church and make the book ideal for Bible Study groups. The author weaves in appropriate illustrations throughout the book, mostly taken from the pastoral context of his ministry in Edinburgh. A very helpful chapter entitled 'the Director of Evangelism' demonstrates the Sovereignty of God the Holy Spirit in evangelistic ministry. Another chapter, 'Reaching out to Families', demonstrates the importance of reaching heads of families in our evangelism in order to evangelise the whole family. A section containing questions and answers on personal evangelism provides a useful conclusion. Every Christian will find this book readable and extremely helpful in facing the responsibility and privilege of being a witness for Jesus Christ. I'm the author/artist and I want to review Active Evangelism.